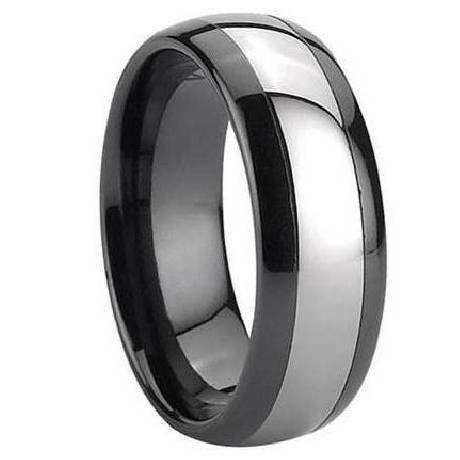 A striking two tone look makes for an instantly memorable tungsten and ceramic ring for men. 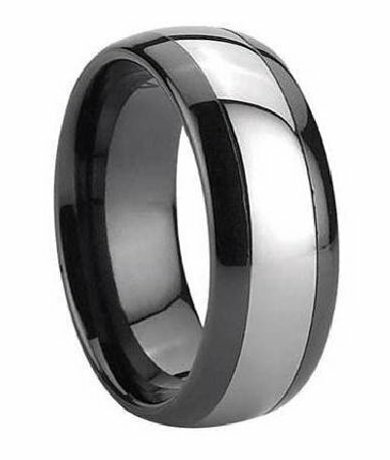 Equally suitable as a contemporary wedding band or fashion ring, this men's ring has a slightly domed shape and polished black ceramic surrounding a tungsten carbide inlaid center. A 7mm comfort fit interior ensures lasting ease of wear. Comfort fit tungsten rings usually run 1/2 size larger, it is suggested you buy a half size smaller than your standard ring size. We recommend having your finger measured for a comfort fit ring at your local jewelry store for an accurate fit. All of our tungsten rings come with a lifetime warranty. Very nice ring especially for the cost. I have been wearing it for over a month at work everywhere and it still looks as shiny and new as when I got it. Fit was as expected. I really like this ring. Excellent ring and exceptional value. I was very skeptical due to the price, but I am very impressed. The quality is superb and I would not hesitate to recommend to anyone.